Gainesville, Florida, has countless areas filled with gorgeous scenery. Everywhere you look, you’ll see greenery, towering trees, and dangling Spanish moss up against blue skies. There are plenty of hiking and biking trails to see it all, or you could try horseback riding in Gainesville, FL! 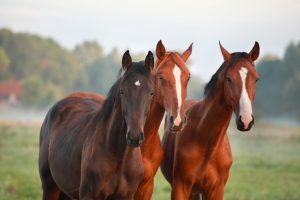 Are you looking for more outdoor activities like horseback riding in Gainesville, FL? We can help! Our complimentary Vacation Guide has all the information you need to create the getaway of a lifetime. In it, you’ll find information about the area’s cuisine, outdoor activities, and other local recommendations. Accessing our guide will save you from hours of research, so don’t miss out on the opportunity! The Canyons Zip Line & Canopy Tours has fun activities for the entire family, including horseback riding excursions! This ride is through The Canyons park, over 100 acres of gorgeous scenery. During the hour and a half tour, you’ll be taken past lakes, massive cliff walls, Southern greenery, and more. Walk-ins are accepted, but it is recommended you have a reservation. Misty Morning Hounds has a gorgeous property you are allowed to ride on for just $25 per rider and horse combination. They are located on the historic Perry Plantation that is home to 527 acres! If you would like to ride here, make sure you contact them ahead of time in case they are hosting other activities on the property. The Haile Equestrian Center is known around Gainesville for its riding instruction, dressage, jumping, and more. Plus, they offer casual horseback riding in Gainesville, FL! Everyone is welcome to take either a 30 or 60-minute ride on the farm. You get to interact with the horses, learn how to groom them, and then go on a ride! Each excursion is guided by a staff member, and they will walk you through everything; beginners are more than welcome. Sawhorse Farm is located right next to the gorgeous and horse-friendly San Felasco Hammock Preserve State Park! Their trail rides first take place on their own 60 acres, then venture out into the park. You can board your own horse with them or borrow one of their lesson horses. No matter what you choose to do, you will be well taken care of by their expert and friendly staff. After your day of horseback riding in Gainesville, FL, come back and relax at Sweetwater Branch Inn. Located just moments away from downtown Gainesville yet set back far enough to be a peaceful oasis, our property has the best of both worlds! On a hot day, you can cool off in our saltwater pool or talk about your day with your pals at our Wine & Cheese Hour. Browse through our accommodations to start planning your stay! Our inn features 20 beautifully restored guest suites and cottages; we’re sure we have the perfect one for you. Plus, each comes with our outstanding amenities! We look forward to seeing you at Sweetwater Branch Inn!